The gem Expansion Joint & Control joint System, designed and developed for builders, by a builder, Joe Borg. 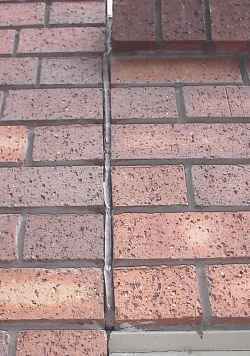 Gem expansion joint - A dried out mastic joint. Not doing it's job any more. The Gem Expansion and Control Joint System is faster and cheaper to apply, with a finish far superior to the messy foam and mastic method. The Gem system is not only more effective and cost efficient, but greatly enhances the appearance of the finished joint, helping to avoid unnecessary and expensive callbacks by concerned owners. 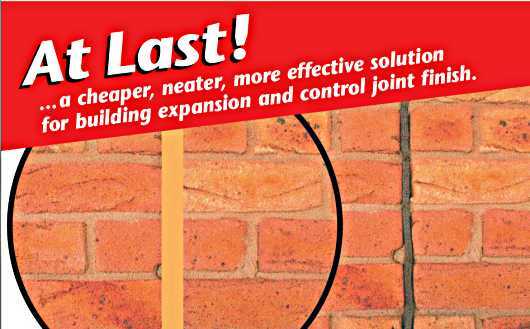 Designed to meet the demands of the various expansion and control joints in both masonry and timber buildings, the Gem system basically consists of a control joint casing and cover strap, both manufactured from extruded, flexible, polypropylene. The casing is tied in to the mortar beds with a specifically designed horizontal expansion tie. The multi stage 'snap in' cover strap (applied after acid clean), is UV resistant, available in limited colours and can be painted. 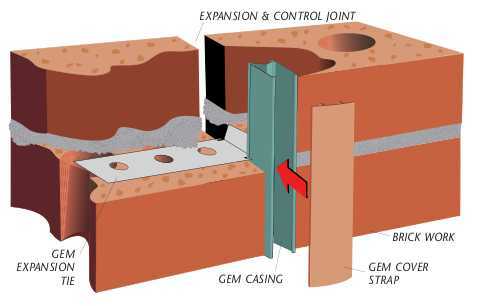 Gem expansion joint - Sketch of the system showing the parts of the control joint and also a Gem expansion tie. 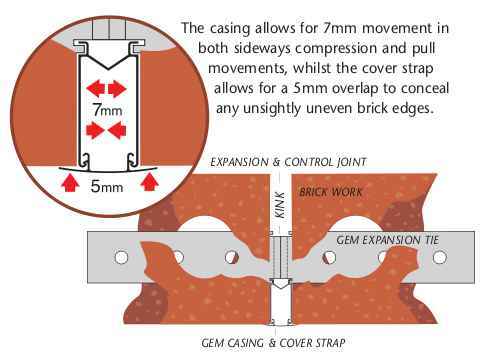 The Gem Expansion & Control Joint System can be used with any size brick or blockwork, by simply adjusting the vertical position of the expansion tie. Once in position, the spring -back design of the Gem casing allows for both sideways compressive and pull movement . The adjustable expansion tie secures the casing by allowing it to move in both sideways compression and spring back, maintaining the integrity of the casing vertically, whilst in a sideways movement. Gem expansion joint - The Gem casing and cover strap detail. With building surveyors now paying closer attention to the specifications of expansion control joints (minimum 10mm gap), there is a need to improve the current system. 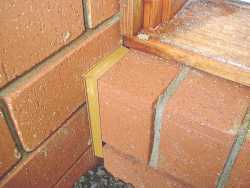 Gem expansion joint - A control joint in a corner around a brick sill. The Gem system not only meets all building requirements, but provides fail-safe easy installation, is cost efficient and pleasing to the eye. 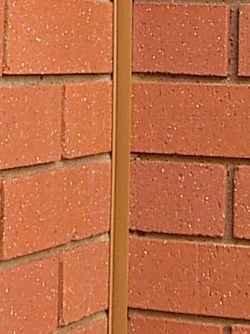 The Gem single cover strap unit is designed to cater for new or existing buildings, including timber constructions. This simple unit will provide the same neat finish to existing standard 10mm expansion and control joints, with or without foam. No time spent filling joints with mastic. No time wasting call backs. No additional time for bricklayer, takes same time to install as foam. 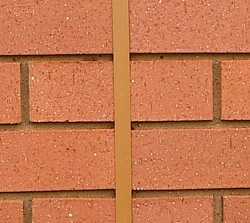 Allows for the long term expansion (the "e factor") of clay bricks. Medium load transfer from brick window/door frame. Conceals movement behind cover strap up to 5mm. Multi stage cover strap suits brick, block and render work, is UV resistant, paintable and prevents water and insect penetration. The cover strap can also be used for concealing security wires. Both the casing/cover strap combinations and the single cover strap unit are sold in convenient 2.7 meter lengths. The email address above is your way to contact Joe, as you can see it is not clickable, but an image. I am sorry but you will have to copy it by hand, as otherwise Joe would very soon get swamped by spam. Joe Borg is from Melbourne and has been in the industry all his life. He has run his own building business for twenty years, before graduating as a building surveyor in 2006. He now runs his own consulting business. I only have an average knowledge of standard brick construction, a few small cavity brick jobs prior to 1975. We build to cyclonic building coding now and as such brick veneer and to a large part brickwork in general is not seen much in Darwin, where I live. Also for the most part we have good foundation soil types. (And rock of course) so we are not plagued by problems that other locations have. So I am not an expert by any means on the complicated subject of articulated masonry construction. Joe Borg on the other hand is very much an expert and from reading Joe's e-mails and the material that he has sent me, I think that there are an awful lot of builders and designers out there who have a less than perfect grasp of the current requirements of the BCA in regard to expansion or control joints. The old ways are not good enough any more, and as the BCA has the weight of the law behind it, many people could be finding themselves in a litigation situation if they don't do it right.